Linkedin logo hand painted onto a variety of ceramic plates, permanently installed onto the entrance wall of the LinkedIn cafeteria. A collaboration with Rapt Studio. "The Mad Scientist", and envisioned cleaning up Edison's workshop and making my own absurd invention from the parts. I could stare and play with this piece for endless hours. AE COM brought us on to create art for this space. Wall sculpture in a mini lounge. 8’H x 14’ W individual painted MDF petal shapes. Collaboration with the 49ers, Goodwill, Antlre and Levi's. Football fans donated 18k pairs of jeans, we separated them by shade at every yard line. Over a span of 20 hours, our crew of 50 covered the field from dark to light following the sunrise. Negative space left in the center with a giant recycle symbol. Five time lapse cameras (filmed by Whitney Dinneweth) captured our installation, it was breathtaking. Giant painted plywood cassette tapes sculpture. Our 8' x 8' deconstructed RCA Victor Vista television art piece for TBS and Rapt Studio in Atlanta GA.
Vintage technology sourced in original colors and knolled to perfection. Adhered to stained and CNC cut wood cloud shape, 4’ x 3’. Digitally printed color fade onto stacked plywood and then CNC cut. We sourced our physical interpretations of Adobe tools for texture, and to include the recent addition of TubeMogul to Adobe we added in our digital media representations. Most items are vintage - arrows, super 8 cameras, magnifying glasses, letterpress T's, paint brushes, rulers, lassos etc. We built in a blue tooth speaker and looped a digital video of clouds and waves for the full "experience". Everything was then knolled and organized to reach it's ultimate OCD potential. Reception desk and lobby entrance covered in 7000 pool noodles encased in sewn fabric tubes, attached to metal ceiling grids with magnets. Our modern take on a closeup of the notorious LYFT mustache. A collaboration with Rapt studio. Vintage cars in gold, succulents in hand painted pots and hundreds of hardback blue books and gold and blue painted driftwood for the reception area. This is a collaboration with Rapt Studio, photo credit Rapt Studio. Giant melted popsicles in logo colors. Painted and resin coated wood and pine shapes, each 7’ x 6’. Vintage indigo dyed fabric made into our custom robot flags for Levi's stores. Hundreds of vintage ties adhered to 30' lettering in the offices of LinkedIn. A collaboration with Rapt studio. Cafe lounge floor and wall murals in collaboration with O+A. CNC cut faceted threedimensional sign for Linkedin headquarters. Made with high density foam and automotive paint. A project with Interior Architects. 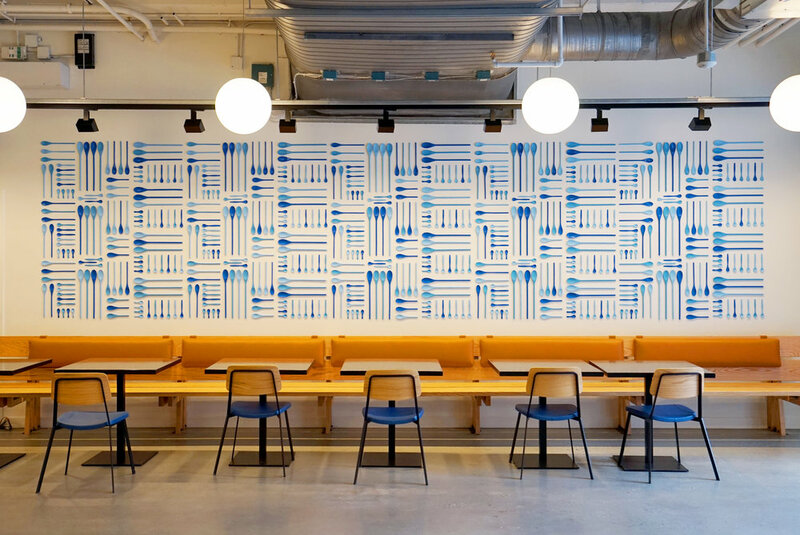 Our 3D graphic mural made from hand painted wooden spoons for the TBS Food Hall, a collaboration with Rapt Studio 6’ H x 22’ W.
This sound wave was created with over 3000 nails and over 700 yards of cording to span 30' in the new Adobe Headquarters in San Jose. It reads "customer engagement" which was recorded by Adobe's very own sound engineering team. Our interactive wall of vintage stereoscopes representing the first "virtual reality" and paying homage to Unity's amazing technology in VR and AR. Each stereoscope has a unique vintage reel and is attached to custom oxidized steel brackets with magnets making the piece interactive. Faceted mirror PLAY sculpture created for Sephora HQ interiors. The permanent piece is 9' x 3'. Wheat pasted poster collages on fire treated plywood throughout the space, one of 23 unique pieces. Game room murals inspired by vintage atari games. Play sculpture made of acrylic and automotive paint covered makeup. Created for the Sephora headquarter interiors. "Peace on Nerf" Our 30' long sculpture mural for BOX headquarters made from Nerfguns and army figurines, all painted white as a peace statement. A project with Sky Design. Art piece of vintage dice on natural canvas 5’ x 5’. Copper cord with copper nails on painted white wood across a 20' x 10' span at the Stitchfix headquarters. A collaboration with Blik Inc. in San Francisco CA. Lobby floating books and 3D letters installation , 20' long, a collaboration with Rapt studio. We made the world's largest wall of outlets, custom for GE. There are a few live outlet sprinkled throughout the piece which are matte vs. gloss and one lone GE blue cord for the touchscreen. It almost looks like subway tile and is an OCD dream come true. 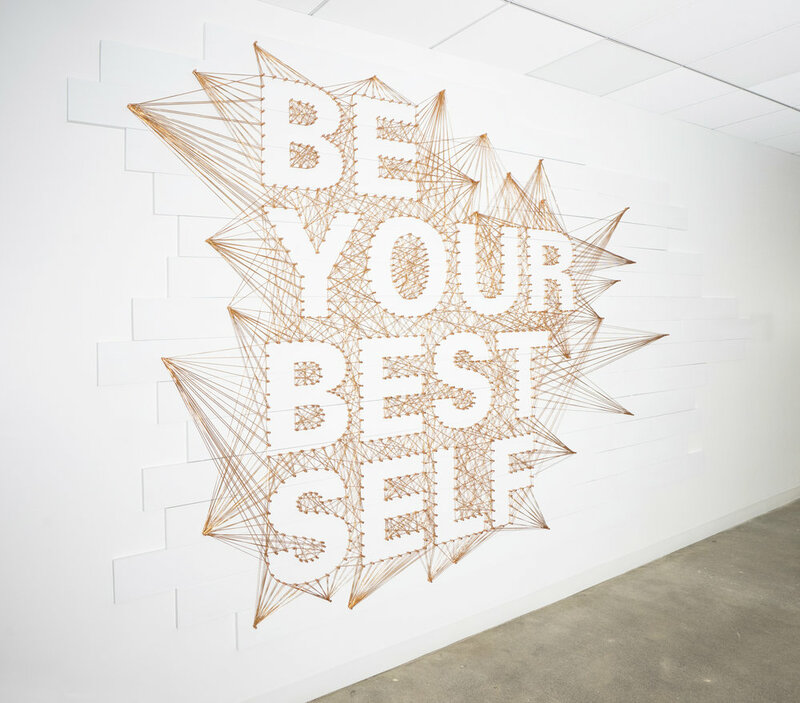 Original string art mural for Cisco headquarters, a nod to connections. 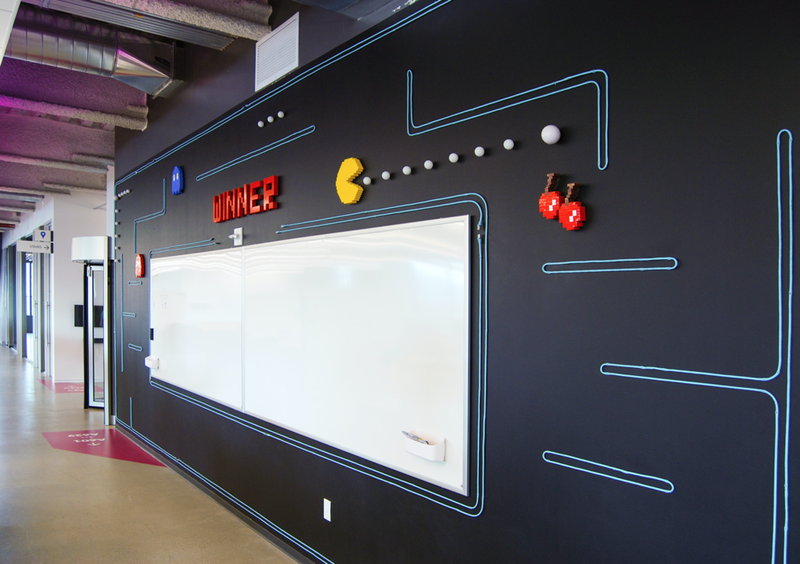 A collaboration with O + A.
Pac-man/Lego/pingpong inspiration wall for BOX employees. 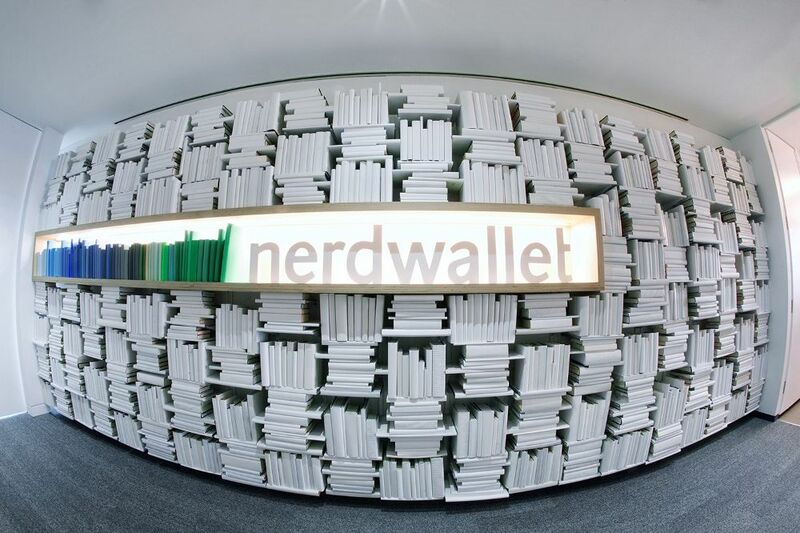 Logo wall made of legos and baseplates for Nerdwallet, 20' long, a collaboration with Rapt studio. Stationary and interactive walls made with custom birch pegboard and neon triangles. Light box cube for indoor Alterra's basketball court. Their mission statement CNC cut braille, backlit with semi transluscent white window film. A collaboration with Rapt studio. Neon PLAY wall sculpture encased in acrylic. This 9' x 3' piece was custom made for the Sephora HQ walls. Sewn denim with steel branding, a collaboration with Kyle Minor. Ping pong logo art piece for Netsuite 6' x 6', a collaboration with Rapt studio. Graphic murals on cement, a collaboaration with O+A. Wheat pasted backdrops on fire treated plywood with dripping columns throughout the space. 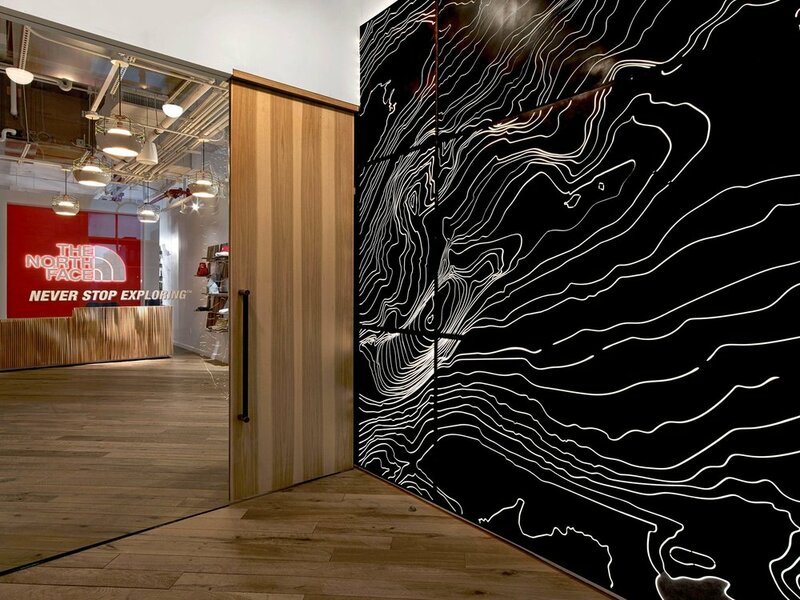 Our 20' backlit steel wall of Half Dome is the glowing entrance to the NY showroom. The hand drawn map is laser cut into steel and oxidized onsite. Digital clouds sculpture installation, white foam adhered to wall, a collaboration with Rapt studio. Backdrop in the 49er stadium museum, 28' long denim American flag. Dyed rope strung between 4 x 4's at Fitbit headquarters. Using stopper knots and bowline knots at the ends. Design by Matt Cottrill of Rapt studio. LED light sculpture for Microsoft break room, a project with O + A.
Printed/painted imagery on OSB, plywood and transparent stretched fabric creating wall sized collage. GAP Inc. headquarters clad with sewn denim panels, floor to ceiling. A collaboration with Julia Lemke. Our 28' long art piece for Basalt, a restaurant designed by Rapt Studio. We collected and sewed together 3000 vintage time cards from the early 1900's. This piece has so much movement and history, it fits perfectly. 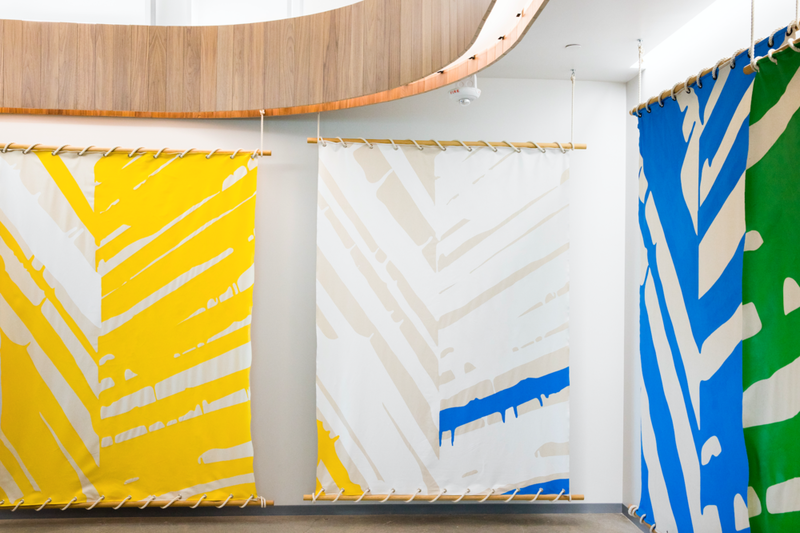 A pop of color with our giant handmade California denim flag for Informatica in Redwood city. CNC cut pine and paint multi layered wall sculpture in lobby area. A pattern of fisheye mirrors paying homage to the altered reality that this company focuses all of it's brilliant efforts on. It's our nod to the amazing work coming out of Unity. 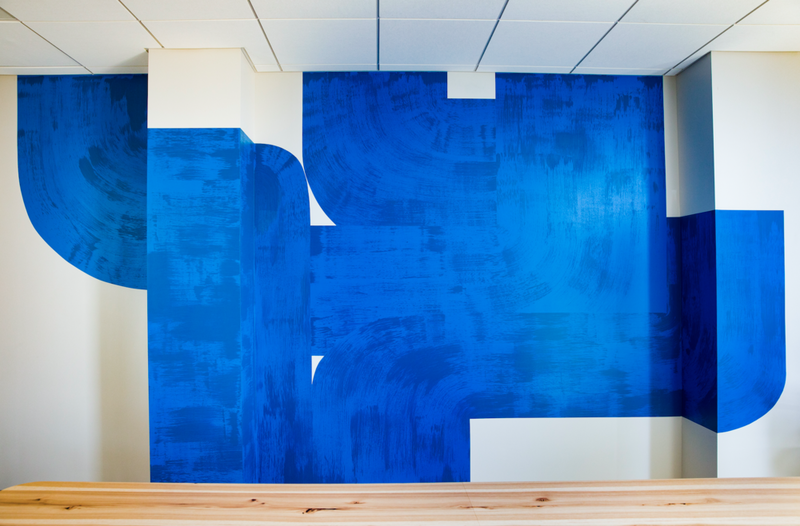 Hand painted art on cement and wood at Uber headquarters in collaboration with O+A. Our art created for the outside wall of the hidden library. 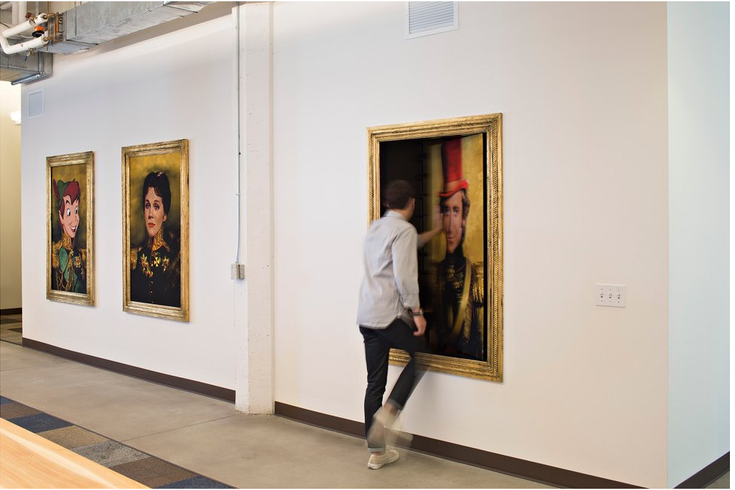 Nostalgic faces painted into generals uniforms in custom gold leafed frames. A collaboration with Rapt studio. Resin Jeans timeline of the history of Levi's, denim, steel, resin, 2 locations each 45' long, located in The 501 Club. Graphic statement hand painted on tile, a collaboration with O+A. Custom copper butterfly reception area in collaboration with Rapt Studio. Cutting board mural wall in the Turner Broadcasting Systems Food Hall, a collaboration with Rapt Studios. 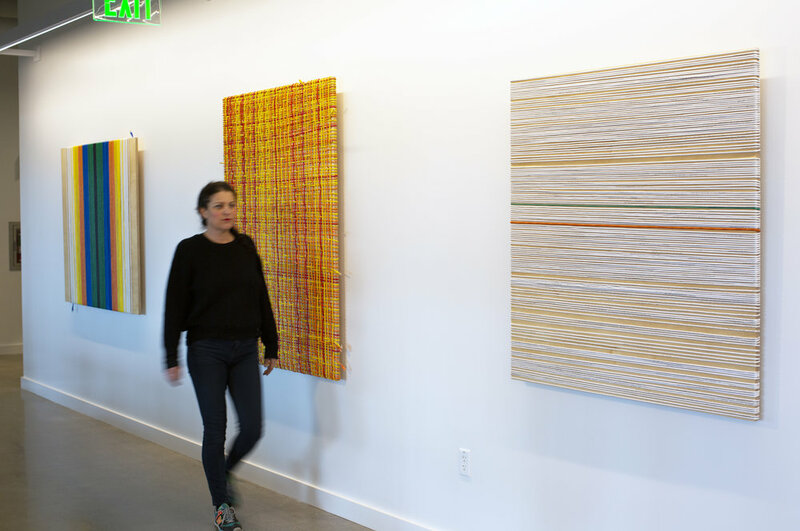 Five paintings on natural canvas, each 5’ x 7’ and hung with natural cotton sailing rope on pine dowels with grommets and colored stitching. Dimensional lobby art, 6'x6' string art. Free standing modern Aspen tree sculptures made from stacked painted wood blocks. Denim and vintage patch wall hangings 6’ x 8’. 28’ tall printed woodgrain illustration on transparent fabric. Modern birch trees on natural canvas wall covering 18’ H x 35’ W.
Deconstructed giant curly slide hanging sculpture 3’ H x 14’ W.
Neon vinyl tape murals in game room - full surround experience. Handmade American flags out recycled Levi’s jeans, one for each store 4’ H x 5’ W.
Matte board slotted leaves sculpture 3’ H x 20’ W.
Vintage library cards wall covering 9’ H x 14’ W.
Precarious stacked box sculpture 3’ H x 8’ W.
Illustrated birch trees on layered transparent panels 15’ H x 28’ W.
Illustrated laser cut powdered coated dimensional leaves mural. Denim wrapped column with appliquéd Levi’s pockets and copper nails paying homage to local San Francisco companies 2’ x 2’ x 6’. Vintage typewriter collection with poems.